We’re so excited to introduce you to our newest Smarty fitness partner, TITLE Boxing Club. We’ve done kickboxing in the past, but let us be the first to tell you: NOTHING comes close to the kind of boxing Title Boxing Club dishes out. If you’re looking for a full-body strength and cardio routine that will leave you dripping with sweat, TITLE’s boxing and kickboxing workout might just be your answer. Oh, and it burns up to 1,000 calories in an hour (yep, we thought that’d get your attention!). 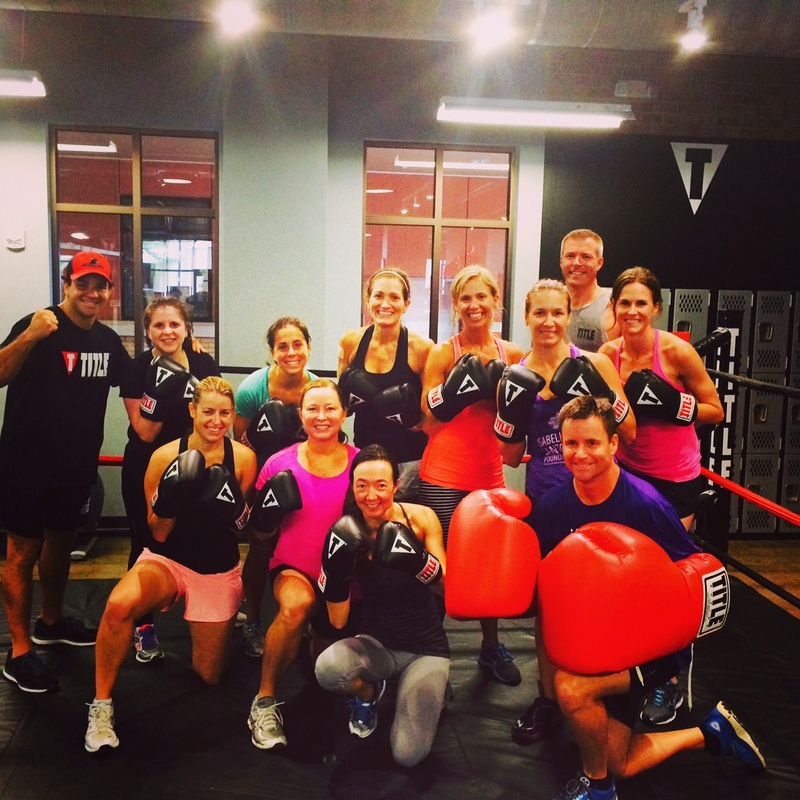 TITLE Boxing Club recently hosted team Smarty and a few of our friends for a one hour private kickboxing sweat session. After a fifteen minute “warm up” (um, we were warm after the first set of jumping jacks, but he just kept GOING! ), eight three-minute boxing sessions, an ab series (with really cool ab moves that had us tremblin’! 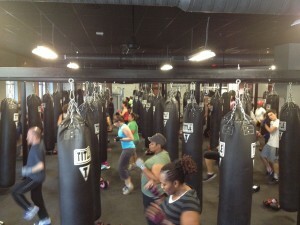 ), and a cool down, we left TITLE Boxing completely spent and SO happy – how could you not? All stress in your life is punched out in those three-minute boxing sessions. Promise. Every single Smarty there thought it was a fantastic work out led by an amazing instructor; and, rumor has it, Team Smarty was sore for a solid two days post-workout ;-). 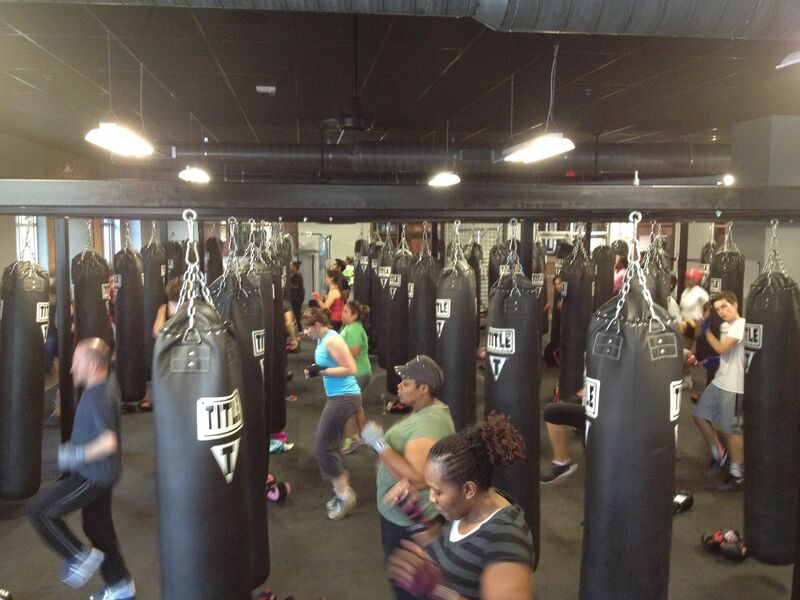 TITLE Boxing Club is led by a super friendly staff – we really can’t say enough positive things about its peeps. They made us feel so welcome and felt so strongly about what they were doing that their positive energy can’t help but rub off on you. TITLE Boxing Club Ayrsley’s owner, Joe Saele, says he wants the business to make a positive impact on people’s lives. Classes range from 30-60-75 minutes and the first class is always free. It’s like a personal training experience in a group setting. ALL fitness levels are welcomed, so no excuses. And, they make it a family affair. Kids as young as eight are welcome to get in on the fun (while accompanied by a parent). We can’t help but think that the lil’ Smarty boys everywhere would L-O-V-E a chance to beat up a boxing bag (girls, too, we are sure!). And, get this: TITLE Boxing Ayrsley has a kids camp! Kids ages 5-13 can join in on what is quite possibly the best energy burner in the QC. Our kids are itching to do this one! Call the club at Ayrsley for more deets – 704.588.3391. Choose from a variety of membership levels, class types, and class times. They’re also up for sports team classes (individualized classes tailored for specific sports teams such as soccer, hockey, tennis etc. ), charity events, and corporate team building events. We had SO MUCH fun in our private Team Smarty class and know that this would make a great Girl’s Night Out (there is a shower at the club!). Title Boxing Club is offering a special promotional rate for CSP readers through August 31: $10 discount off the regular monthly rate. Make sure to mention you are a Smarty when you sign up. Small group training is also available at a discounted rate for 2-12 people at a time. Private sessions unique for your group. Discuss your goals as a group and the trainer will take it from there. Smarty Summer Steal: Fun Facts About Fleas & a Smarty discount! Down at Fraggle Rock . . .